Set your tweets to hashtag #nww15! 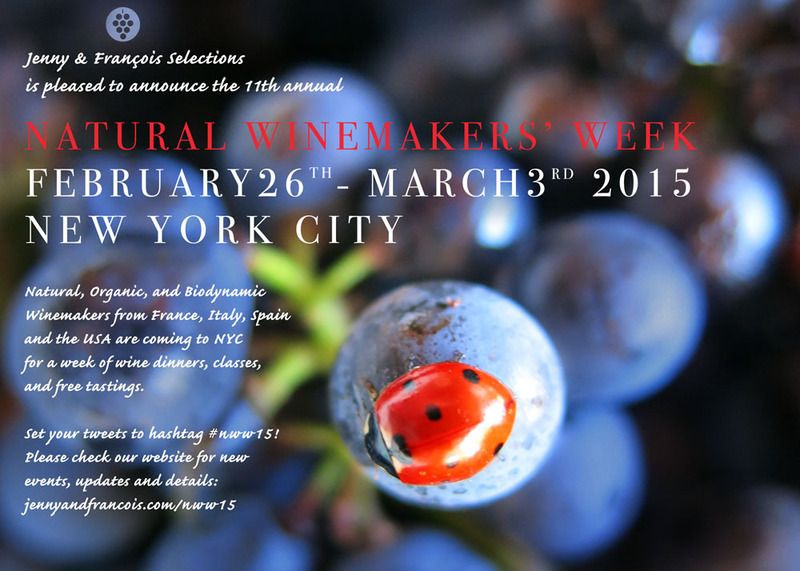 are coming to NYC for a week of wine dinners, classes, and free tastings. Free Tasting with Chemins De Bassac and Azimut. Free Tasting with Ca’ dei Zago. Free Tasting with Dirty & Rowdy, Remi Dufaitre, Quantico, and Plageoles. Free Tasting with Dufaitre, Oudin, Grange Tiphaine, and Clos Siguier. French Winemaker Dinner with Nathalie and Isabelle Oudin, Plageoles, and Dufaitre. Featuring a seasonal, hearty meal to compliment the natural wine. $75/person (tax and tip included). Loire Valley Winemaker Dinner with Damien Delecheneau of La Grange Tiphaine and Fabien Boisard of Domaine du Mortier. Featuring a 3 course all inclusive dinner. Sparkling at 6:30pm. Dinner at 7pm. French/American Natural Winemakers’ Dinner with Dirty & Rowdy, Montebruno, and Jean-Marie Rimbert. $85/person. Buy tickets at Event Brite here. 10am-5pm: Jenny & Francois Portfolio Tasting 287 Spring Street between Hudson and Varick St.
Natural Wine Party! featuring all the winemakers, wines by the glass, and sweeping views of the Manhattan skyline.